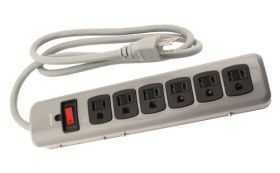 The heavy duty indoor surge strip has a sturdy impact resistant metal housing with 1500 joules surge protection. Power strip has 6 horizontal outlets with built-in safety covers, 15 amp surge protection with a LED indicator and a lighted on/off switch. Mounting keyholes located on the back for easy hanging. 14 Gauge/15A/1875 Max watts.